A flawless Monday night in November. 60 degrees and a supermoon. Which I had never heard of before but has something to do with the closest approach the moon makes on its eliptical orbit resulting in some massively large moon, er something like that. It’s big round and in its most basic terms reminds me of a rotating full carbon disc rear wheel. Which only serves to remind me how I should have been out on the perfect ride tonight, but instead sat sprawling on the couch in sweatpants and a flannel shirt I’ve worn for 2 days. I told myself it was a recovery day but really I just sat recovering from a meatball dinner. But it was not a lost evening since my guilt for missing out on a ride workout was replaced as I sat mesmerized by an hour and a half of what I consider the most visually stunning example of grace and speed. 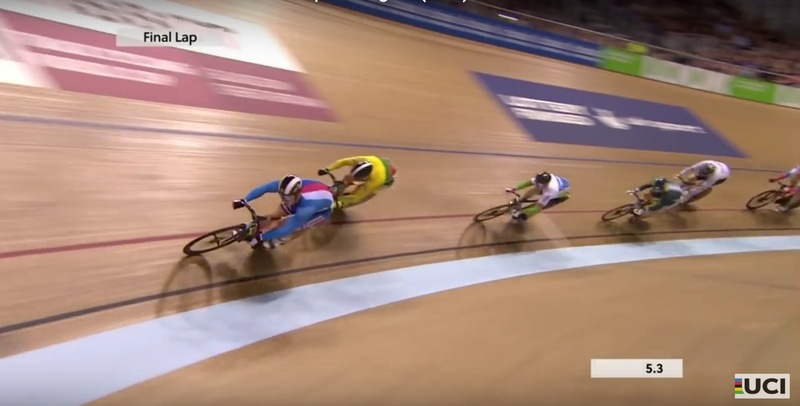 It was the UCI Track Cycling World Cup from Apeldoorf, Netherlands. And unlike most track events that receive barely a thread of coverage on Olympic prime time TV. Tonight I received a full uninterrupted dose of track racing. And the best part, no Bob Costas interruptions.